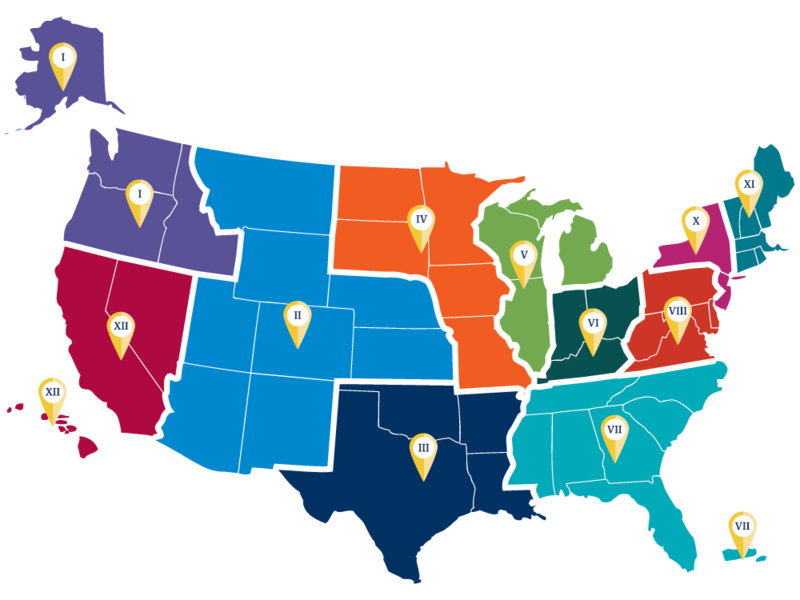 NAFSA's membership in the United States* is organized into 11 geographic regions that provide the important grassroots strength of the association. Many opportunities for involvement, association activities, and leadership are found at the regional level. Navigate to your respective region’s page below and reach out to the regional leadership to learn more about how to get involved! Each region is governed by an elected chair and an executive team to carryout the region’s annual work plan. The regional team as a whole is composed of representatives of the knowledge communities, interest groups, states and districts, and many other regional constituents. Many states and metropolitan areas also hold regular NAFSA meetings. The regional teams often sponsor workshops on topics of special interest and annual conferences. Get in touch with your leadership team to find out more about what is happening at the regional, state, and local levels! 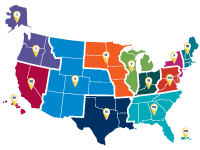 Annually in the fall, the 11 NAFSA regions hold their conferences. These are excellent opportunities to network with accomplished colleagues, stay current with the latest trends, and engage on critical issues relevant to your daily work. View dates and locations for this year's conferences. Assess needs of regional leaders and design processes, guidelines, tools, training, etc. to serve them. Facilitate the development of sound business and leadership practices in the regions, consistent with the fiduciary obligations of the association—fiscal, legal, and ethical. Encourage members in the regions to provide their information in the member skills database for consideration for task forces and leadership positions for which they have particular expertise. *Members who reside outside the United States are encouraged to participate in professional development activities that take place at the regional and national levels and to become involved in NAFSA's volunteer leadership. NAFSA also works collaboratively with sister organizations in other countries and world regions that promote international education and exchange. Please contact us at regions@nafsa.org.